As we watch our community evolve, we see growing need. We are positioned to understand issues facing our communities through our unique lens, with the ability to scan the 40 counties of Middle Tennessee we serve to identify trends. Historic Fact: The county was created in 1807 when the citizens of Rutherford County living south of the Duck River and the Stones River successfully petitioned the governor to split Rutherford County into two. The new county was named after Revolutionary War officer Thomas Bedford.. Historic Fact: The county was named for former Tennessee governor Newton Cannon. Point of Interest: The county’s long tradition of white oak basket and chair-making has gained the attention of collectors and museums worldwide, including the Tennessee State Museum, the Smithsonian Institution and The Museum of Folk Culture in Hunan Province in China. Historic Fact: The county was formally established in 1856 by dividing portions of Davidson, Dickson, Robertson, and Montgomery counties. Point of Interest: The Cheatham County Court House is the place to be on Memorial Day Weekend to view the best work of local artists or perhaps enter your own work a be discovered. A “blind jury’ made up of noted local artists’ judge the work and award prizes to the top five entries. Historic Fact: The county is named for Colonel William Christian, a native of Augusta County, Virginia, and a veteran of the Revolutionary War. Additionally, this agricultural community is where, in 1962, the late Harry Young is credited with planting the first field of no-till corn on a commercial farm in the United States. Today, most of the county’s grain crops are raised using no-till methods that Young helped pioneer. Point of Interest: Throughout its history, Christian County has been an agricultural community. With an estimated 1,171 farms covering nearly 300,000 acres, the county annually ranks among Kentucky’s top counties in crop revenues and overall agricultural revenues. Historic Fact: Clay County is the home of Cordell Hull’s First Law Office which still stands today in Celina, at the Clay County Museum. Cordell Hull served as Secretary of State for Franklin D. Roosevelt, fostered the Good Neighbor Policy with Latin America, and developed the United Nations for which he won the Noble Peace Prize in 1945. Point of Interest: Dale Hollow Lake in Clay County is home of the world record Smallmouth Bass, Rainbow Trout and German Brown Trout. Historic Fact: The Tennessee General Assembly established Coffee County from parts of Bedford, Warren, and Franklin Counties in 1836. It named the new county in honor of General John Coffee, a close political ally of Andrew Jackson. Point of Interest: The Bonnaroo Music Festival, a four-day, multi-stage camping festival held on a 700-acre farm in Manchester, has been held annually in the county since 2002. Historic Fact: Crossville and Cumberland County lay claim to being called the “Golf Capital of Tennessee” thanks to having 11 championship golf courses. Historic Fact: Davidson County origins date to 1783, when the North Carolina legislature created the county and named it in honor of William Lee Davidson, a North Carolina officer who died in the Revolutionary War on January 1, 1782. 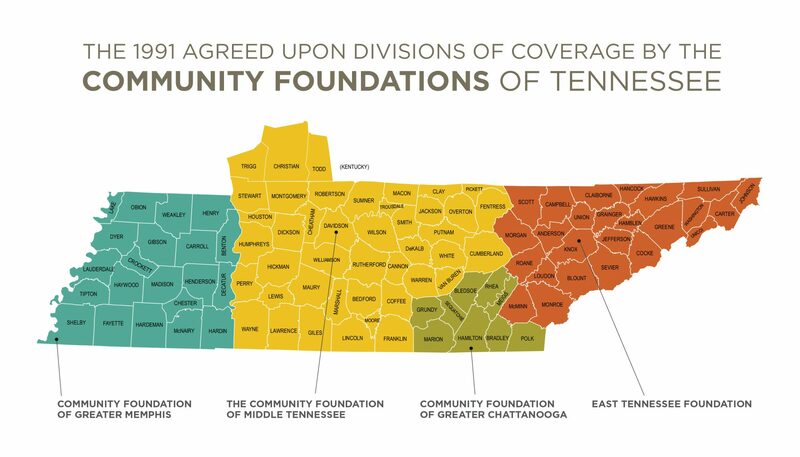 Point of Interest: Davidson County is home to the state’s capital of Nashville, which is also where The Community Foundation of Middle Tennessee office is based. At the heart of Music City are its myriad musical offerings from shows at the historic Ryman Auditorium, Grand Ole Opry, Nashville Symphony, Bluebird Cafe, or the honky tonks of lower Broadway to the history archived at the Country Music Hall of Fame and numerous other stops for tourists and locals alike. While music is the lifeblood of the city, Nashville boasts numerous cultural and entertainment options from professional sports including the Tennessee Titans, to art offerings at venues like the Frist Center for the Visual Arts and theaters, to a burgeoning food scene, and much more. Historic Fact: DeKalb County is the home of Center Hill Lake, a 54-mile long reservoir with 415 miles of largely undeveloped shoreline and 18,200 acres of deep, pure water – the ideal habitat for many species of fish. The lake offers a wide variety of sporting opportunities including boating, fishing, water-skiing, camping, picnicking, hiking and swimming. Additional attractions located on the lake are Edgar Evins State Park and Center Hill Dam. Historic Fact: Civil War soldiers built the railroad that now fronts the Historic Halbrook Hotel, War Memorial Building and the new city park. Point of Interest: Dickson County is the home of the world famous Renaissance Center, where you will encounter the second most advanced Cyber Sphere in the world. It’s also home to the oldest working courthouse in Tennessee. For the outdoor enthusiast, Montgomery Bell State Park is a great place for hiking, fishing, golf and many other recreational activities. Historic Fact: Fentress County is known as the “Trail Riding Capital of the Southeast” to the equestrian community with hundreds of acres of trails, overlooks, unique geological formations and waterfalls. Many horse campgrounds, cabins and stables are located in the county and in and around the parks. Point of Interest: Fentress County has one of the lowest property tax rates in Tennessee – $1.34 per hundred, based on 25% of residential value and 40% of industrial value. Within the city limits of Jamestown, the city also has an additional rate of .54 per hundred based on the same percentages. Historic Fact: Named for Benjamin Franklin, the settlement of the county began around 1800 and was formally organized in 1807. Point of Interest: The University of the South was organized before the Civil War. It began full operations shortly after hostilities ceased. It remains the only higher education institution in the county, and encompasses a full university and theological seminary. Historic Fact: Southern agriculture pioneer and publisher Cully Cobb was born in Giles County. He was an editor of Progressive Farmer magazine before accepting an appointment in Washington, D.C., in Franklin D. Roosevelt’s administration. Point of Interest: Giles County is named after William Branch Giles, who was Senator of Virginia and sponsored the admission of Tennessee as the sixteenth state into the Union. He also sponsored the building of the city and courthouse, which has burned four times. Historic Fact: In April 1791, Edwin Hickman, a native of North Carolina, led a surveying party into what is now Hickman County. Hickman’s party included James Robertson, later known as the Father of Middle Tennessee; Robert Weakley, who also played a prominent role n the early history of the state; and others. The party camped at the mouth of a small creek on the north side of Duck River opposite the present site of Centerville. Point of Interest: Natchez Trace, a national parkway of 450 miles from Nashville to Natchez, Mississippi, goes through the southwest corner of Hickman County. Baker’s Bluff, one of the most scenic views along the Natchez Trace, is located here, overlooking the Duck River and fertile farmland typical of this area. Point of Interest: Houston County has scenic beauty, access to lakes and rivers, arts and community theatre, children’s activities, and more. It’s most famous for its Annual Irish Day Festival held each March. With vibrant rolling hillsides, its early Irish immigrant settlers found that the county resembled their Irish homeland. Historic Fact: Humphreys County is rich in history with Civil War artifacts, antebellum homes and more. The Humphreys County Museum and Civil War Fort is a treasure trove of historical information. The Museum includes a Civil War Room, World War I Room, World War II Building, Jesse James Exhibit, Captain Anderson Exhibit and other interesting collections donated by Humphreys County residents. Point of Interest: One of Humphrey County’s largest attractions is Loretta Lynn’s Ranch and Family Campground where visitors are allowed a glimpse into the personal life of the country music star. Historic Fact: Jackson County was named in honor of Andrew Jackson, the seventh President of the United States. Jackson County, the eighteenth county established in Tennessee, was created by an act of the Tennessee Legislature on November 6, 1801. Point of Interest: Located in present-day Jackson County, Fort Blount was established in 1794 at the point where the Avery Trace, which connected the Eastern and Mero Districts, crossed the Cumberland River. Named for territorial governor William Blount, this post replaced an earlier blockhouse that had been constructed in 1792 at the eastern edge of the Mero District. Built by the territorial militia, Fort Blount was later garrisoned by federal troops, who remained at the post until about 1798. Historic Fact: The county was named in honor of Captain James Lawrence who, while commanding the USS Chesapeake in an 1813 engagement with the Royal Navy frigate HMS Shannon, issued the famous command: “Don’t give up the ship!”. Point of Interest: An early resident who served as one of the county’s first commissioners and justices of the peace was David Crockett, who lived in the county for a few years and ran a water-powered grist mill, powder mill and distillery in the area of county where David Crockett State Park is now located. Historic Fact: Lewis County is named for explorer Meriwether Lewis (of Lewis and Clark fame) who died and was buried at Grinder’s Stand in 1809. Lewis’s grave is located at the geographic center of the county. Point of Interest: The Lewis County Museum of Natural History and Discovery Center features exhibits on early American Settlement, the Civil War, Gordonsburg Mining and Swiss settlement. Historic Fact: Lincoln County was carved from territory ceded to the United States by the Cherokee and Chickasaw Indian tribes on November 14, 1809 and was named for Revolutionary War hero General Benjamin Lincoln. Point of Interest: The centerpiece of the year is undoubtedly the Lincoln County Fair, which has been consistently judged as one of the best local fairs in America and Lincoln County’s fair boasts the only horse harness racing in the State. Historic Fact: Macon County has lots of agriculture-related tourism activities, including two wineries, pick-your-own blueberries and strawberries, fishing, hunting, and a corn maze. Point of Interest: The Donoho Hotel is a historic hotel in Red Boiling Springs in Macon County. Built in 1916, the Donoho is one of three hotels remaining from the early-20th century resort boom at Red Boiling Springs, and the last of the great white frame hotels with full-length two-story verandas. Point of Interest: The Dixie Theatre has been a part of Lewisburg since 1913 and is now located on the north side of the city’s square. It ceased being a movie theatre in 1985, and in 1994 the Marshall County Community Theater bought the Dixie and renovated the interior. Historic Fact: It was formed in 1807 from Williamson County and Indian lands. Maury County was named in honor of Major Abram Poindexter Maury of Williamson County, who was a member of the Tennessee legislature and an officer. Point of Interest: The Athenaeum was founded in 1852 by Rev. Frank Gillette Smith who had left Virginia about 1837 to head Columbia Institute, a finishing school for young ladies, sponsored by the Episcopal Church. Historic Fact: The name Montgomery honored John Montgomery, who was a founder of Clarksville, as well as General George Rogers Clark, a renowned Indian fighter and Revolutionary War leader. Military activity impacted the county during World War II when the army established Camp Campbell in Montgomery County. Over 42,000 acres were purchased and in June 1942, relocation of facilities was completed. The post was named in honor of General William Bowen Campbell. On April 15, 1950, the post became Fort Campbell when it changed from a temporary installation to a permanent one. Point of Interest: As the ninth-fastest growing city in the nation, Clarksville-Montgomery County is home to Austin Peay State University, Dunbar Cave and Port Royal Natural Areas, the Customs House Museum, the Roxy Theatre, and nearby Fort Campbell, to name some attractions. Fort Campbell is home to the 101st Airborne, the only Air Assault Division in the world, as well as the 5th Special Forces Group (Airborne) and the 160th Special Operations Aviation Regiment (Airborne). Historic Fact: Moore County is the location of the Jack Daniel’s distillery, the oldest registered distillery in the United States, whose famous Tennessee whiskey is marketed world-wide. Despite the operational distillery, the county is a dry county. Historic Fact: Overton County was formed in 1806 from Jackson County and Indian lands. The county was named for Andrew Jackson’s friend Judge John Overton, Judge of the State Supreme Court, and co-founder, with Andrew Jackson and James Winchester, of Memphis. Point of Interest: Dale Hollow Lake is home to the largest Federal trout hatchery east of the Mississippi. There are over 12 other marinas serving boaters along the lakes 620 mile shoreline. Clear waters provide great fishing, swimming and scuba diving. Historic Fact: Perry County was formed in 1819 from parts of Humphreys and Hickman counties. It is named in honor of Oliver Hazard Perry, American War of 1812 naval officer who, after his flagship was severely damaged, continued the fight from another ship and forced the surrender of the British fleet at the Battle of Lake Erie. Point of Interest: The area is home to Mousetail Landing State Park, a 1, 247-acre area located on the east banks of the Tennessee River in the state’s picturesque Western valley. Tradition has it that Mousetail Landing received its name during the Civil War period when one of the area’s tanning companies caught fire. The exodus of mice fleeing the burning tannery was so profuse that the area in proximity of the park became known as Mousetail Landing. The scenic Buffalo River flows nearby, providing opportunity for family canoe float trips. Historic Fact: Cordell Hull (October 2, 1871-July 23, 1955) was born in a log cabin in present day Pickett County. The only one of five boys who showed an interest in learning, Hull obtained a law degree in 1891. Elected to Congress from the Fourth Tennessee District in 1907, Hull served as a U.S. Representative until 1931 and was elected U.S. Senator for the 1931-1937 term but resigned upon his appointment as secretary of state by the age of sixty-two. Following nomination by Roosevelt, Hull earned the 1945 Nobel Prize for Peace in recognition of his work in the Western Hemispheres, for his International Trade Agreements, and for his efforts in establishing the United Nations. Point of Interest: Dale Hollow Lake is located in Pickett County, as well as the Cordell Hull Birthplace Museum and State Park which portrays Cordell Hull’s humble beginnings in Pickett County and his worldwide success serving the United States as the longest running Secretary of State, founder of the United Nations and recipient of a Nobel Peace Prize. Historic Fact: After its original formation in 1842 was declared unconstitutional, Putnam County was firmly established February, 11 1854, when Richard Fielding Cooke’s bill, with amendments, cleared the Tennessee House. Point of Interest: Tennessee Tech University, a comprehensive university offering 44 bachelors and 20 graduate degree programs within six academic divisions, is located in Cookeville. Historic Fact: In 1796, when the state’s first general assembly met, an act was passed that provided for the division of Tennessee County into two counties. The eastern half was named Robertson in honor of James Robertson, Father of Middle Tennessee and early leader of the Watauga and Cumberland settlements. The act also provided for the commissioners to purchase fifty acres of land for Robertson County’s seat of government and specified that the town be named Springfield. Point of Interest: Robertson County is home to the “Turning of the Pig” event in Greenbrier, the “Trash and Treasures” in Cross Plains and the “Search for the Bell Witch” in Adams. Historic Fact: Rutherford County was formed in 1803 from parts of Davidson, Williamson and Wilson counties, and named in honor of Griffith Rutherford. Its location between Nashville and Chattanooga made it a highly contested area during the Civil War, with the battle of Stones River being one of the bloodiest confrontations of the western theater. Point of Interest: The county’s seat, Murfreesboro, is home to Middle Tennessee State University, the largest undergraduate university in the state of Tennessee. Historic Fact: Smith County is home of former Vice President Al Gore and at onetime was the home of former U.S. Secretary of State, Cordell Hill, who practiced law in Smith County. Point of Interest: The economic growth of Smith County (with new industrial parks, plants, equipment and infrastructure) has resulted in over $60 million of investment since 1980. Historic Fact: Stewart County is home to Fort Donelson National Battlefield, which preserves Fort Donelson and Fort Heiman, two sites of the Civil War. Point of Interest: Sleep among the whispering pines at Piney Campground, located along the shores of beautiful Kentucky Lake. Piney campers can take advantage of a variety of lakefront and woodland camping options. Historic Fact: The county is named after Revolutionary War figure Jethro Sumner. Sumner was a brigadier general in the Continental Army during the American Revolutionary War. Point of Interest: Hendersonville and Sumner County are home to Trinity Broadcasting Network, the world’s largest religious television network. Free tours of the facility are available, including the studios, auditorium and gift shop. This property was formerly known as “Twitty City,” and was owned by country music legend Conway Twitty. His mansion is still on the grounds, and available for tour. Historic Fact: Christian and Logan counties were called upon to contribute to the creation of Todd County due to the outlying population of both Logan and Christian’s demand for a “home government” so that travel to the county seats of Logan and Christian was no ylonger necessary. Point of Interest: The landscape features steep bluffs and sharp rises and falls within the terrain. Historic Fact: The county is named for Stephen Trigg, a frontier officer in the American Revolutionary War who died in the Battle of Blue Licks. Point of Interest: Trigg County is located next to beautiful Lake Barkley and is home to the Trigg County Ham Festival. Historic Fact: The county probably has a greater percentage of paved roads than any other county in Tennessee. Trousdale saw its first traffic light go up in 1946, it’s first parking meters in 1952, it’s first rest home in 1956, and by 1960, it had six punch-clock-type factories. Point of Interest: A Trousdale cemetery is the eternal resting place for over 50 Confederate Veterans, among them Colonel James Dearing Bennett, commander of the famed 9th Tennessee Cavalry. After the battle, Winslow Hart (the son of James Hart) and other citizens buried both Federal and Confederate dead on a knoll at the rear of the cemetery. Historic Fact: Van Buren County was established January 3, 1840 from the lands of Bledsoe, Warren and White counties, and is named for President Martin Van Buren, our nation’s eighth president. Point of Interest: Big Bone Cave is one of the best-known and most historic caverns in Tennessee. It was mined by prehistoric Indians for gypsum and salts, and was the site of the largest saltpeter mine in Tennessee during the War of 1812 and the American Civil War. Historic Fact: Warren County was named for Revolutionary hero, General Joseph Warren, the first General killed in the War of Independence. The county seat of McMinnville was named for Joseph McMinn, who was speaker of the Tennessee Senate at the time the county was created, and later one of the outstanding Governors of our State. Point of Interest: Today, Warren County is best known as the Nursery (plants) Capital of the World. With hundreds of nurseries offering both wholesale and retail shopping, Warren County is a landscaping hobbyist’s dream. The county is home to Cumberland Caverns, more than 32 known miles of caverns and many more estimated miles of virgin cave, making it one of the most extensive caves in Tennessee. Visitors can tour the caves daily. Bluegrass Underground is a radio show recorded live 333 feet below ground at Cumberland Caverns in a natural amphitheatre. Historic Fact: Wayne County is named for the colorful General “Mad Anthony” Wayne, who was a revolutionary war hero who fought alongside tyGeorge Washington. Point of Interest: The annual Tour de Wayne begins and ends at the Wayne County Welcome Center in Collinwood and is a big hit with bicycle enthusiast. Tour through rural southern middle Tennessee, taking in the Natchez Trace Parkway and ride along the banks of the Tennessee River. Historic Fact: On September 11, 1806, an act of the Tennessee General Assembly created White County out of Smith and Jackson counties, responding to a petition signed by 155 residents of the area. Point of Interest: Blue Spring Cave, located five miles northeast of Sparta, is the longest mapped cave in Tennessee and the tenth longest cave in the United States, with 35.0015 miles of passages. Historic Fact: Franklin and Williamson County were created by the Tennessee General Assembly on October 26, 1799. Carved from neighboring Davidson, the new county was named for Dr. Hugh Williamson, a Revolutionary patriot and distinguished statesman from North Carolina. Point of Interest: One of the fastest growing counties of the state, Williamson County hosts a variety of festivals and parades, offers a growing local arts and music scene, Civil War battlefield and history, and other attractions. It’s home to Arrington Vineyards, owned by country music star Kix Brooks of Brooks & Dunn and open to the public for wine tastings and live music on the weekends. Historic Fact: The life size statue of General Robert Hatton has been the focal point of the Lebanon Public Square since May 20, 1912. Point of Interest: The Wilson County Museum, also known as The Fessenden House, was given to the Historical Association of Wilson County by Sallie Fessenden in March of 1983. These numbers are based on the 2010 U.S. Census (unless otherwise indicated).